Posted on Tue, Feb 7, 2012 : 4:19 a.m.
Brunswick Stew is classic Southern fare, the origins of the sturdy soup contested feverishly in the South. Did the recipe originate in Brunswick County, Va., Brunswick County, N.C. or Brunswick, Ga.? Loyal to our next-door neighbor state, my Alabama mother was certain its naissance was Brunswick, Ga., and she made Brunswick Stew often when I was a child. First comes the chicken, poached with aromatics until tender. I've never made the soup until now and mined the internet for recipes. What I found gave pause... copious amounts of ketchup and/or barbecue sauce were used in most recipes to thicken the broth. I'm sure my mother didn't do that, but I can't find her recipe. Digging deeper, I found recipes that claimed authenticity and didn't include ketchup, but they did include squirrel. I'm not talking just one recipe; all of the recipes purporting to be authentic included squirrel. The wish-bone is set aside to dry. We've got some plump little critters that have been using our cable line for dental floss after robbing the bird feeder, and it may not take much to tempt my husband...hey now! You know I'm just kidding! But you see my dilemma. So here's my Michigan version of Brunswick Stew, which substitutes chicken for squirrel, spices for ketchup, and the frozen vegetables I used were a fine substitute for fresh. 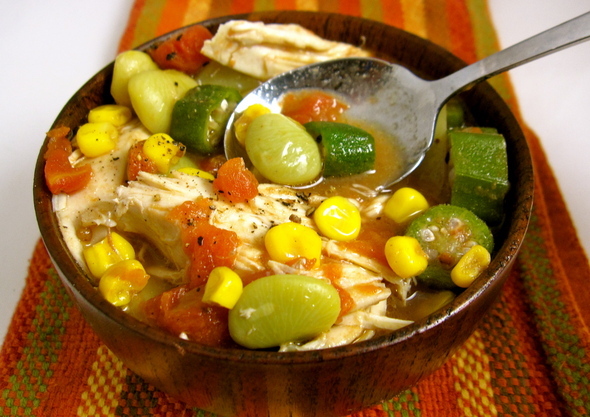 I do remember my mother poached a chicken and used the reduced stock as a base for the soup, which I did in the following recipe.This makes a big batch loaded with vegetables, potatoes and chicken; leftovers are a bonus. 1. In a large pot, place the chicken, bay leaves, peppercorns, garlic, herbs and celery, and add enough water to cover two inches. Bring to a boil over high heat. Reduce the heat to medium low and simmer, until the chicken can be pulled from the bone, 1 1/2-2 hours, depending on heat of the simmer. Use a slotted spoon to transfer the chicken to a bowl and cool. 2. 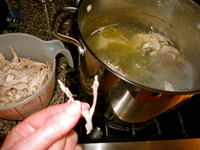 Remove chicken from the carcass; shred and reserve. Return bones to pot. Over high heat, reduce stock until it has reduced and is well-flavored, 1-2 hours. (At this point you could refrigerate the stock, then skim the fat after it has risen to the top.) Strain bones and aromatics from stock. 3. Add tomatoes and onion to clear stock and simmer over low heat 1 hour. 4. Combine sugar, vinegar, mustard and Worcestershire and stir into soup. Add potatoes and lima beans and simmer until just tender, about 20 minutes. In the last few minutes of cooking time, add corn and okra and return chicken to the pot. Season with kosher salt and freshly ground pepper. Pass the Tabasco. My new web site has recently been launched (www.dinnerFeed.com)! I'm a real-time food writer and photographer posting daily feeds on my website and in the Food & Drink section of Annarbor.com. You may also e-mail me at peggy@dinnerfeed.com. Tue, Feb 7, 2012 : 5:58 p.m.
Tue, Feb 7, 2012 : 4:47 p.m. I'm a Virginia girl--and we don't use potatoes or okra (not traditionally anyway). That's the big difference between the Georgia and Virginia. NC doesn't even get recognized usually. But they did contribute the BBQ sauce seasoning. I don't put enough to thicken, just to flavor (thickening comes from cooking it all day). And I use a sauce bottled by a local BBQ place back home. I never found my own seasoning blend (yours is actually a basic BBQ sauce base) to be as good. I use way more tomatoes with just baby limas (we call them butterbeans down South) and corn. Been making it ever since we moved to the midwest (and have an annual fall event). The squirrel is traditional, because it's a fall hunter's stew. Had friends who made it every fall out on a campfire, cooking all day in a big iron pot. Made enough to feed a couple hundred people. But we sub chicken too. The saying goes that the chicken was the fallback if the hunter's didn't catch anything. The last few years I've twisted the recipe by roasting the chicken.